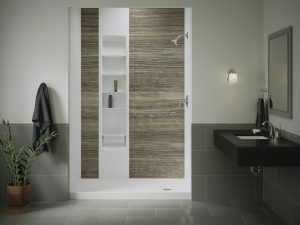 When Safe Showers performs a tub-to-shower conversion in your home in the San Antonio, Texas, area, we’ll not only make your bathroom safer to use for loved ones with disabilities or who are aging in place, but we’ll also give it a facelift with a stunning new shower from the famed KOHLER Choreograph collection. KOHLER Choreograph showers are prized in the industry for their gorgeous appearance, customizable options, and safety features. At Safe Showers, we’d be happy to update the aging tiles or other outdated materials in your bathing area with a beautiful wall surround designed with the perfect colors, textures, and accents to suit your taste. Plus, there’s a whole range of showerheads for you to consider to provide the look and functionality you need. One of the key features of a KOHLER Choreograph shower is the low step-in entry. By virtually eliminating the threshold barrier and the risks that come with having to step over it, your new shower will be much easier to access for those with mobility limitations. In fact, when you combine this feature with the shower chair that we will include for free, your new shower will be wheelchair accessible. At Safe Showers, our installers have made countless bathrooms safer with our remodeling services. You can trust that they will deliver the highest level of craftsmanship through every step of your renovation. And, because we keep our products in stock at our showroom, you can count on a faster installation than other bathroom remodeling contractors can provide. For peace of mind that your investment is protected, we’ll include both a lifetime warranty on your new KOHLER Choreograph shower and a one-year labor warranty. To begin designing your new KOHLER Choreograph shower, contact the safe-bathing experts at Safe Showers today. We proudly serve homeowners in San Antonio, Austin, and throughout the Texas Hill Country.